Jenni is visiting until Sunday, so John and I both took yesterday off work. We're having a relaxing Thanksgiving weekend and will be doing some cooking later today. Alex was moving around a lot yesterday. (Maybe it was the Thai food I had for dinner...) It was enough movement for John to feel, which was a first. 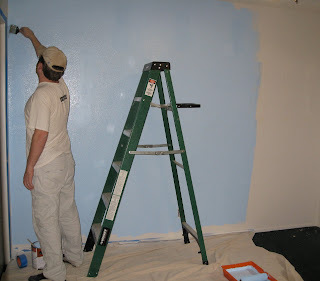 John is painting the nursery blue ("Acre Morning"). He already removed the shelves that had been mounted to the wall. I'm attempting to find new places to store things that used to be stored in the bedroom. The color goes with the Alphabet Soup accessories that I like. We still need to find a crib and dresser, but I have a few options in mind. Wendy visited November 8-10. We made it to the Alamo, Riverwalk, and La Cantera mall. 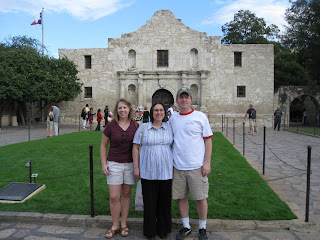 It was her first trip to Texas. Jenni will be here for Thanksgiving. I'm 22 weeks along and can feel Alex move now. It took me a while to be sure of the feeling since it is something totally new.